Siri and Selma love walking through the saltmarshes to ‘The Edge‘, to this ever-changing end of the land, where the sea constantly kisses the coast. We feel drawn to edges, to the limits – but further, we don’t need or want to go. The expression ‘The Edge‘ for our coast wasn’t coined by our beloved Bookfayries but by Britain’s foremost nature writer Richard Maybey, whose second home is the North Norfolk coast. In his autobiography ‘Home Country‘ he describes how he experiences the area around Blakeney (our next village), there where we like to swim. Siri und Selma lieben es, durch die Salzmarschen zur ‘Edge‘ zu gehen, zu diesem sich ständig ändernden Rand des Landes. Uns zieht es zu den äußeren Rändern, zu den Grenzen – aber darüber hinaus müssen wir nicht unbedingt gehen. Der Ausdruck ‘The Edge‘ für unsere Küste stammt nicht von unseren geliebten Buchfeen, sondern von Englands führenden Naturschriftsteller Richard Maybey, dessen zweite Heimat bei uns ist. In seiner Autobiographie ‘Home Country‘ beschreibt er, wie er die Gegend um Blakeney erlebt, etwa dort, wo wir es lieben, im Meer zu schwimmen. The only soul around, a bait digger. Also, the author Edward Frederic Benson praised the unique secluded beauty of our coast. He spent quite some time birdwatching here. A lot of writers fell in love with our constantly changing coast as we did. What fun it is jumping over little creeks, to wade or swim through the bigger ones to reach the otherworldly outer sandbanks. There is our favourite place for swimming or just looking lazily across the sea or into the big blue sky. Everything is that vast that we feel limitless. There is an absolute silence, what a luxury, enhanced by the quieting murmur of the waves and the cry of the gulls and terns. Die einzigartige einsame Schönheit dieser Küste lobte auch der Geistergeschichten sammelnde Autor Edward Frederic Benson, der hier seinem Hobby der Vogelbeobachtung frönte. Viele Autoren verliebten sich in diese gestaltwandelnde Küste und wir ebenso. Was für ein Spaß, über kleine Priele zu springen, größere zu durchwaten oder zu durchschwimmen, um dann in die Anderswelt der äußeren Sandbänke zu gelangen. Dort ist unsere Lieblingsstelle, um zu schwimmen oder träge aufs weite Meer oder in den Himmel zu schauen. Alles ist so weit, dass wir uns selbst grenzenlos fühlen. Absolute Stille, welch ein Luxus, herrscht hier, nur durchbrochen vom beruhigenden Plätschern der Wellen und dem Schrei der Möwen und kühn fliegenden Seeschwalben. Where the crystal clear Stiffkey River runs into the North Sea. The water is still going out. But do you know what is really special here? The water is crystal clear. No garbage offends the white sands, not even a lonely shoe or a plastic container that pollute other beaches have found their way to our place. We met instead a seal pup who looked at us with his big eyes when we swam through the last creek to our favourite sandbank. Aber wisst ihr, was das ganz Besondere hier ist: Das Wasser ist kristallklar. Keinerlei Müll beleidigt den weißen Sand, nicht einmal ein einsamer Schuh oder Plastikcontainer, die andere Strände vermüllen, haben den Weg zu unserem Strand gefunden. Stattdessen sahen wir gestern einen jungen Seehund, der uns mit seinen großen Augen betrachtete, als wir durch den letzten Priel zur Sandbank mehr schwammen als wateten. The sea is heavenly warm and tempting and a bit frightening. Soon the tide will turn. It’s our dear Selma who urges us to overcome our phlegm and enjoy this one-hour long adventure trip exactly timed according to the tide table. Being out there comes Dina’s part to persuade our dear Master to swim in the sea. Siri believes he is hydrophobic. He denies this vehemently. The old Greeks were afraid of the edge, our dear Master mentions. They assumed one would fall at the edge of the water into the void. But we never ever swim that far to the horizon. Es ist unsere liebe Selma, die uns antreibt, unsere Trägheit zu überwinden und die eine Stunde Abenteuertour genau nach der Tide ausgerichtet, zu unternehmen. Danach kommt Dinas Part, Masterchen zu überreden, im Meer zu schwimmen. Siri meint, er sei doch wasserscheu, was er jedoch vehement bestreitet. Haben sich nicht im klassischen Griechenland die Menschen vor der ‘Edge’, dem Rand gefürchtet, führt Masterchen an. Sie nahmen an, dass man am Rand des Meers von der Erde ins Unendliche fällt. Aber ehrlich gesagt, soweit schwimmen wir eh nicht hinaus. This was the last creek we had to conquer to stay safe of the incoming tide. So we spend these hot days. But now we have to blog sitting on our terrace at home in the deck chairs under the shady fig tree the notebooks on our knees and a drink at hand. This we call ‘civilized’ repressing our fear of global warming. So verbringen wir die heißen Tage, doch nun muss geblogged werden zu Hause auf der Terrasse im Liegestuhl unterm schattenspendenden Feigenbaum, das Notebook auf den Knien, ein Drink zur Hand. Das nennen wir mit dem treffenden englischen Ausdruck ‘civilized’, die Angst vor Global Warming verdrängend. With warm greetings from the sunny Norfolk coast. Keep cool, drink a lot! Mit herzlichen Grüßen von der sonnigen Küste Nord Norfolks. Keep cool und immer viel trinken! This entry was posted in Norfolk, England and tagged E.F. Benson, North Norfolk coast, Richard Maybe, Stiffkey. Bookmark the permalink. Herrliche klare Weite- da schwappt kühler Wind rüber. Tolle Fotos! ja, diese erfrischende Seebrise ist wohltuend. Danke, dass dir Dinas Fotografien gefallen. In erudite words and wonderful photos, this post beautifully sums up everything that is best about Norfolk, and its stunning coastline. If you go to the sea at the Stiffkey marshes and Holkham f.e. you will see blue water like in the Carribean. Thank you very much for your kind commentary! It’s so far to the water and so flat, I would guess that when the tide comes in you have to run for higher ground. It’s wonderful that it is so clean. The rest of the world should take notice! we love this shallow water as it warms up quite quickly. In Cley, where it’s deeper, the sea is much colder but nevertheless comfy for swimming. You are right, one has to time these excursions following the tides. The tide comes in fast and usually from behind. The water in the creeks is rising first and there is quite a frightening current. Out there the beaches are amazingly clean and you don’t see people usually. It’s an advantage that the sandbanks are hard to reach. Wouldn’t it be great if all the beaches would be as clean as this beach? Probably the hard-to-reach sandbanks have something to do with the beach being so clean. You are lucky to have access to a place like this. Be careful of that creek when the tide comes in. That hardly any people come out there leaving their litter helps a lot to keep these beaches clean and that’s there is no current washing all the plastic in the sea on the beach too. Thank goodness for the security fairies. That’s an important job. Lovely post, Fab Four of Cley. indeed, long may these waters stay clean. We have our little excursions to sea nearly every day now. It’s the best place to be. We are lucky that there are still tourist-free beaches even in the summer. No plastic at the beach – it’s great, isn’t it? I love the wee open spaces. Beautiful. Darn iOS sleek check! That should be wide not wee. We love them too and feel drawn to them. That north Norfolk coast is so beautiful and wild. But I do like the coves and beaches down here in Cornwall. None as empty as your photos depict though! I am currently watching the cloud roll by my windows – no rain, but a lot of cloud and mist these last few days. not all beaches are that empty here during the summer. But we have quite a lot of hidden beaches where no tourists are because you have to know about the tides and the way through a labyrinth of creeks. We have a cloudless blue sky here what Dina doesn’t like. She wants clouds for her photos. What we like in Cornwall best were the powerful high waves. The sea at our coast is more like the Mediterranian Sea, except in late autumn and winter. You wouldn’t want to get caught by the tide! And yes, I know how busy Wells beach gets! And Cromer I imagine. Lovely blue sky here today, the coastal fog burned off by midday, but it was quite surreal down by the lighthouse. you are absolutely right, Cromer, Wells and Sheringham beaches are crowded as well as Holkham. But there are still kind of hidden beaches where you will be on your own, nobody as far as you can see. We know this coastal fog problem here as well, but it’s a long time since we have had this – we think it was for a couple of days in March this year. Now we wouldn’t mind. We seem to get it a lot! And there is still some over the sea I think. Helps cool things down though. Our garden would love some sea mist, that would make the flower fairies smile again. When we get sea mist here (‘sea fret’ called in Norfolk) it’s often for several days in spring. We like this spooky atmosphere. How absolutely gorgeous! It’s too hot be outside, what’s happening? I would love to join you hiking through the Stiffkey freshes to the open sea. I haven’t been there for years. And then we only made it through one creek, the low tide was too high, do you remember. But it was totally different then. 20° and lots of rainy days in between. this summer is really extraordinary. In the 35 years, we live here we never had such a long summer with sunshine and hot weather every day. We make it nearly daily to the sea. When we were in the Stiffkey freshes the timing wasn’t perfect, sorry. Next time you are visiting we will time it much better. It’s a promise. A cold beer – what a great idea! Incredible place! It is a real source of the Divine energy! Thanks for sharing, dear Klaus! For us this beach it’s a healing place, we love it. Getting there and going back is a little adventure which adds to the beauty of that beach. It seems to be endless alike Time! A special place indeed! It really is – our little gem. I know I speak for all of your readers when I say that we look forward to your magical words of description and stories told. “The Edge” – what a clever way to bring fantasy and mystery to mind and Dina’s professional photography giving us visitors a peek at your world. Thank you and stay cool and drink a lot this summer! this beach is quite magical, clean, quiet and empty. That’s ‘The Edge’ of Norfolk where we live. Thank you so much for liking our words and pictures. We will go to the sea soon but not before wishing you a wonderful week. who are always walking out to the sea with some water bottles and a big hat. Thank you very much, dear Rob. ‘the Edge’…..fantasy and mystery indeed…..as ever,marvellous images and enticing words! Thank you, dear Sue, for your kind words. Fantasy and mystery – they inspired quite a lot of authors to write about this area. Most famous is “The Eagle has Landed” by Higgins but far more inspired by this landscape is “Salt” by Jeremy Page. His novel is placed where these pictures are taken in the Saltmarshes between Morston and Stiffkey. And I wish you all a lovely week ahead! indeed, a beautiful edge that is. Fabulous photography. Just plain lovely. It’s really great here at the coast of North Norfolk. We are happy to be able to live here. for the bait diggers, the times have changed drastically. Up to 50 years ago a bait digger could buy a little cottage and provide a family. Nowadays nobody can survive with bait digging which is quite a hard physical work. Bait diggers are mostly solitary older men who love it being on their own out there. They know a lot about tidal flows in the creeks. When you see them going back it’s time for you to leave as well. In a way, people always felt that they are living on the edge. Already some of the classic Greek philosophers had this feeling. Is it worse now? Outstanding photos this week, Klaus. Dina’s views of the broad sandy beaches remind me of the views that we see in Pt. Reyes. I can hear the waves now. We wish you a great week to come. The western part of Marin County looks a lot like the rolling landscapes that I see in photos of Scotland, just not green year-round. It’s not that harsh here like in Scotland and, we suppose, as at yours as well. Wonderful images, Dina. 🙂 🙂 And a member of U2! we are very sure that it’s that unspoiled there has to do with getting there. First, you have to know how to reach the sea, meaning how to cross a labyrinth of creeks, and second, you have to wade but mostly swim through the last two creeks before you reach that large sandbank. It’s an effort to reach this peaceful place as it is always an effort to reach peace. Everyone has their own edges and maybe one has to confront one edge after the other – the edges within and those in nature. By the way, this beach is ideal for meditating. I once read the seeker has to go, go and just go on – and then he/she can go beyond. Well, this effort-idea – I don’t really know if that’s Calvinistic ideology or a kind of general law. It’s great to reach something you put some effort in – but maybe it would be even greater to reach it effortless? Anyway this beach you can’t reach without putting an effort in and it’s good so. I have been wondering whether the present heat wave has held you back from blogging and has driven you closer and closer to the edge of the sea in order to get relief from the deadly sun rays. There you go and indeed found the wondrous world at the cooling sea. Dina’s photos displaying the wide open spaces have literally blown me away. Greetings to the Fab Four of Cley! you are right, we actually are more at the beaches around here than blogging. We collect samphire (sea asparagus), swim and doing nothing. It’s not the right weather for sitting inside blogging. We are quite lucky because of this heat wave over Europe didn’t affect us that much. The temperatures are around 25 degrees C with a soft sea breeze. A much bigger problem is that there is no rain. Poor plants, they are suffering badly. Thank you very much for liking Dina’s photography. These enormous open spaces like to be photographed, especially from a photographer like Dina loving the graphics of it. we too are fortunate to have the Arrow Lake to go to, swim in and paddle in our canoe. Fed by the might Columbia River it is truly refreshing in the present heat wave. The worst part is that our air is polluted by the hundreds of forest fires that are ravaging our beautiful province. Also best wishes and warm greetings from Peter and Biene! we hope that these fires are soon extinguished. Especially Sweden has the same problem here, big fires ravaging the huge forests. Fabulous images, Hanne. Love being on “the Edge” with the Fab Four. I have an affection for tiny humans on the horizon so I really enjoyed those. this tiny bait digger shows the dimensions. As it is quiet there you hear him digging a mile or more away. You have the feeling of being the only people on this planet. The early Romantic painter Caspar David Friedrich used people in his pictures in this way as well. We always do that – don’t worry. Aber nun ernsthaft: ich bin absolut fasziniert von Dinas grossartigen Bildern. Ich kann mich nicht satt sehen daran. eigentlich ist das ja gar kein Wetter, um vorm Bildschirm zu sitzen und zu bloggen, da doch die weiten Strände rufen. Wir schwimmen nie weit hinaus – wegen dieses Randes 😉 und der Strömung, die nicht zu unterschätzen ist. Auch in den Prielen läuft das Wasser so schnell, dass es dir den Sand unter den Füssen wegspült. Toll, dass dir Dinas Bilder gefallen (uns auch). eigentlich sollte ich hier auch nicht am Computer sitzen, sondern, wie ich in meinem Blog gerade zu Helmut Hartmann geschrieben habe, lieber in der Haengematte im Garten unter den Baeumen liegen. 😉 Aber wie das so ist: ich bin in meiner morgentlichen Routine gefangen und checke E-Mails – bei einem guten Kaffee. Hach – wenn ich das hier so schreibe, und wenn ich John Howell’s Post “Views from the Neighbourhood” von heute ueber den Hafen von Port Aransas vor meinem geistigen Auge habe, dann denke ich, Mary und ich sollten unbedingt mal wieder an die Kueste fahren, fuer ein paar Tage. Zu Dinas Bildern: die wuerde ich einmal gerne in voller Aufloesung auf unserem grossen Fernsehbildschirm sehen. Das stelle ich mir fantastisch vor. So, gleich geht’s zum Fruehstueck. Der Magen meldet sich schon. jetzt geht’s aber gleich zum Faulenzen in den Liegestuhl auf die Terrasse. Unser Gärtner holt gerade so etwa 400 ltr. Wasser von Leuten die ihre Regentonnen nicht benutzen und so haben wir dann wieder für knapp eine Woche Gießwasser, da das Badewasser hinzukommt. Ich schwimme nie so weit hinaus, dass ich keine Bodenberührung mehr habe. Auch hier gibt es den deutlichen Versatz von West nach Ost in einer Sägezahnbewegung. Siri 🙂 und 🙂 Selma nehmen wir vorsichtshalber stets an die Leine, wenn wir im Meer schwimmen, was wir selten tun, denn das Wasser ist selten so warm. Ja, diese Sandbänke haben wir auch, an denen sich die Wellen brechen. Leider, ganz unromantisch, auf Sandbänken mehrere Meilen vor unserer Küste sind Windfarmen gebaut worden. Wir können uns gar nicht mehr vorstellen, nicht an der Küste zu wohnen – so nach der Devise: einmal Küste, immer Küste. Dina crashte gerade mit ihre übergroßen Rohdaten ihren großen Mac – big Desaster. So arbeiten wir nun beide auf unseren MacAir Notebooks – and Siri 🙂 und 🙂 Selma auf ihrem MacFee. bevor wir nach Fredericksburg umgezogen sind, haben wir uns ja ungefaehr zwei Jahre nach Orten umgesehen, wo wir uns ansiedeln wollten, und dabei auch die Kueste [Port Aransas oder Rockport/Fulton] in Betracht gezogen. Und auch wenn es da schoene Anwesen [allerdings noch auch deutlich teurer als hier im selber schon nicht ganz billigen Fredericksburg] gab, so haben wir uns letztendlich eben doch fuer Texas Hill Country und Fredericksburg entschieden. Ein ganz wesentlicher Grund waren die deutlich hoehere Durchschnittstemperatur da unten und die hohe Luftfeuchtigkeit. Fuer ein paar Tage ist das ja ganz nett, wenn man dann am Strand liegen kann. Aber das immer zu haben, das wollten wir nun doch nicht. Ausserdem ist da unten eher “cultural backwater”, um das mal so auszudruecken. Das erheblich vielfaeltigere kulturelle Angebot hier in Fredericksburg hat eine grosse Rolle bei der Entscheidung gespielt. Das können wir gut verstehen, lieber Pit. Wir geniessen es wirklich, lieber Klausbernd. 🙂 Uebrigens: vom 21. is zum 24. werden wir wieder in Port Aransas sein, zur Feier unseres 9. Hochzeitstages [am 22.]. Wir freuen uns schon richtig drauf. Mal sehen, wie es da aussieht. Port A leidet ja immer noch – Du hast es auf John Howell’s Blog bestimmt mitbekommen – unter den Folgen von Hurrikan Harvey. Es ist ganz schlimm, wie wenig hier den kleinen Staedten von staatlicher Seite aus geholfen wird. [Und dabei geht es denen noch vergleichsweise gut gegenueber Puerto Rico]. P.S. : Ich halte Dina die Daumen, dass sie ihren grossen Compi schnell wieder hinkriegt. P.P.S. zum Wohnort: Und Rehe haetten wir an der Kueste ja auch nicht. Geraden zoge mal wieder welche aesend vorm Fenster hier vorbei. In den vergangenen Tagen hatten wir einen veritablen Rehkindergarten hier. Einmal waren es sage und schreibe 8 Kitze gleichzeitig. Wir haben hier unsere Fasane, die Dina versucht zu konditionieren, dass sie ihr aus der Hand fressen. Aber ernsthaft: ich habe schon seit Langem vor, mich einmal am spaeten Nachmittag draussen hinzusetzen und die Rehe eben micht nur zu fuettern, sondern auch zu sehen, wie nahe sie mir kommen, wenn ich ganz still da sitze. Ob sie mir, nach einer (langen) Eingewoehnungszeit, aus der Hand fressen wuerden? Faende ich ganz Klasse. Ich denke mir schon, dass du das hinbekommen kannst. Es ist wohl so – nach Skinner & Co – man muss gewünschtes Verhalten eher zufällig verstärken, um die Konditionierung schneller hinzubekommen. Die meisten Leuten machen es falsch, dass sie ständig verstärken und dann auch noch zu viel. Auf diese Weise dauert es ewig bzw. kommen sie nie über eine bestimmte Grenze. Ich bin kein grosser Freund von Fasan, und bei Wild esse ich eigentlich nur ab und zu mal Hirsch(steak0 oder Wildschwein [Gulasch oder Braten]. Dann wünschen wir euch einen wunderfeinen Urlaub mit Feier am Meer – so sehr. Dina scheint ihren Rechner wieder im Griff zu haben mit der Hilfe vom telefonischen Apple-Support. Danke, Ihr Lieben, 🙂 Ich werde berichten. Schoen, deass Dinas grosser Compi wieder funktioniert. Nee, nee, lieber Pit, das ist hier anders. Du gibst auf der Apple-Website dein Problem kurz an und deine Telefonnummer und eh du zu Ende geschrieben hast, rufen sie schon an und führen dich geduldig – auch wenn’s Stunden dauert – durch die Reperatur. Da können wir uns nicht beklagen. Und das Ganze ist ein kostenfreier Service. Alleine schon das überzeugte uns, von PC auf Apple zu wechseln. Nun benutzen wir seit etwa 3 Jahren nur Apple-Geräte und sind zufrieden damit. Sag mal, wenn du kommentierst und antwortest ist die Reihenfolge der Aufführung deiner Kommentare eher zufällig – oder? Don’t worry we don’t mind. Danke fuer diese Erklaerung, lieber Klausbernd. Das wusste ich nicht. Bisher sind wir eben mit Marys i-Pad und i-Phone immer nach San Antonio gefahren. Mal sehen, wie es sein wird, sollte Mary mal Hilfe mit ihrem MacBook Pro brauchen. Du siehst, Mary ist voll und ganz auf Apple abgefahren. Da sie frueher in der Schule und auch zuhause nur Macs hatte, hat sie sich mit Windows nie so richtig anfreunden koennen. Apropos Deine “Appple Werbung”: fuer Mary nicht noetig [s.o. ], und fuer mich “alten Windows Sturkopf” unwirksam. 😀 Aber im Ernst: ich bin so an Windows gewoehnt, dass ich kein anderes System will. Und ausserdem muesste ich ja eine Reihe von Programmen neu anschaffen. Wobei es mit Sicherheit einige, von mir sehr geschaetzte, gar nicht fuer Macs gibt. Da muesste ich dann eben auf ein Equivalent ausweichen, und das will ich erts rcht nicht. Das mit den Programmen kann ich gut verstehen. Und in der Tat für Mac ist alles teurer. Apple versucht mit allen Mittel eine gewisse Exklusivität zu erzeugen, was man auch an den extrem feschen und großen Apple-Store hier sieht. Das bezahlen wir natürlich alles mit. Ich hatte keinerlei Schwierigkeit mit der Umstellung, wohl da ich vorher bereits mit iPad und iPhone arbeitete. Da bin ich gerade bei, lieber Pit, auf Terrasse sitzend dir schreibend. Danke für den Link zu dem Artikel von der New York Times about the drought showing the history of the landscape. – Bei uns hat’s zum Glück letzte Woche geregnet, was auf der Stelle die Pflanzen aufatmen ließ. Unsere Wassertonnen sind auch voll. Nun haben wir etwa tausend Liter Gießwasser, was genügen sollte. Dina ist gerade auf einem Foto-Workshop, und ich installiere mit Siris 🙂 und 🙂 Selmas Hilfe eine Little Free Library an unserer Grundstücksgrenze. Darüber werden wir sicher ‘mal bloggen. Gern geschehen, lieber Klausbernd, was denLink angeht. Bei uns hat es auch geregnet, so etwa 33 Liter pro Quadratmeter, und das hat gut getan – aber nur etwas. Sehr tief in den Boden wird das kaum eingedrungen sein, so ausgetrocknet wie es hier war. Deswegen geht es weiter mit dem Waessern, auch einiger grosser Baeume. Mal sehen, ob wir uns auch Regenwassersammeltonnen anschaffen. Wir schauen uns gerade im Internet um, was es da so gibt. Nur: die Kapazitaet ist natuerlich ziemlich begrenzt, wenn man nicht riesige Tanks im Garten haben will. Eine Little Free Library: prima Idee. Ob sie bei uns hier, an der Stadtgrenze, auch etwas bringen wuerde, das bezweifle ich. Es gibt aber auch schon zwei oder sogar drei [muss ich Mary mal fragen] hier in der Nachbarschaft. Da waere es dann vielleicht gut, einfach da etwas beizutragen. heute regnet es endlich wieder wie angesagt. Richtig gemütlich ist es und es wird wohl den ganzen Tag regnen. Danach soll dann der Sommer wieder so weitergehen wie bisher. Wir hatten dann etwas über 40 Stunden Regen, was genügt, um alles durchzunässen. Bei uns ist das mit den Wassertonnen nicht so ein Problem, mit 4 Wassertonnen, die teils miteinander verbunden sind, können wir immerhin tausend Liter Wasser auffangen, was für unseren Garten genug ist. Dazu kommt, dass wir unser Badewasser ebenfalls regelmäßig auffangen. Bei uns geht ein Wanderweg an der Grundstücksgrenze vorbei und außerdem wohnen wir ja im Ort, so gibt es hier stetigen Fußgängerverkehr. Wir glauben auch, dass solch ein öffentlicher Bücherschrank so gelegen sein muss, dass Leute regelmäßig vorbeikommen. Uns geht’s gut, wir hoffen von euch das Gleiche. Hier scheint der Sommer ebenfalls so weiterzugehen wie bisher – jedenfalls fuer die naechsten 10 Tage. So weit reicht die Vorhersage, die ich (jeden Morgen) verfolge. 1000 Liter waeren fuer unseren Garten natuerlich zu wenig, nicht nur, weil er so gross ist, sondern ganz besonders weil es so gut wie keine Blumen und kein Gemuese zu waessern gibt, sondern den Rasen und – jetzt zusaetzlich – auch Baeume. Da kommen wir eben ohne Wasser aus dem Tiefbrunnen nicht aus. Dazu kommt, dass wir uns an die Einschraenkungen halten muessen, die die Stadt vorgibt. Siehe dazu hier: “Watering Restrictions” [https://wp.me/p4uPk8-1qR]. Uebrigens: selbst “grey water” [das wir aber eh nicht nutzen koennen – jedenfalls nicht ohne sehr aufwendige Umbauten] unterliegt Vorschriften seitens der Stadt. Was ich jetzt bei unseren Baeumen mache: ich installiere ein selbstgemachtes “drip irrigation” System. Dazu habe ich alte Gartenschlaeuche in geringen Abstaenden mit einem ganz feinen Bohrer perforiert, ein Ende verschlossen und das andere mit einem Anschluss fuer den Schlauch von der Wasserleitung her versehen. An zwei unserer Eichen habe ich diese dann schon “verbuddelt” [unter Kompost und Mulch]. Erste Tests waren prima. Diese “drip irrigation” Systeme unterliegen zwar auch den Vorschriften, aber wir duerfen sie haeufiger nutzen: jeden Tag morgens und abends fuer jeweils 4 Stunden, nicht wie oberirdische Rasensprenger nur mittwochs. Das kommt jetzt um sehr viele Baeume drumherum. Nachher geht’s uebrigens zum Rasen Maehen. Der waechst sehr unterschiedlich – abhaengig von Bodenbeschaffenheit, Grassorte und Sprinklerreichweite. Aber einige Stellen sind da, die unbedingt gemaeht werden muessen. So, das waer’s mal von hier und heute. P.S. : Ich hoffe, Dinas Workshop war erfolgriech. da hast du wohl Recht, bei uns geht’s nur ums Bewässern der Blumen und Tomaten. Den Rasen liessen wir völlig braun werden, was, wie gesagt, das Moos absterben lässt. Wie bei dir kommt auch bei uns der grüne Rasen wie eine Art Flickenteppich zurück. Hier bewässern einige ihre Tomaten nach deinem Prinzip, wir machen es per Hand in altbewährter Gärtnerweise mit der Gießkanne. In Norfolk gibt es keine Vorschriften bezüglich des Wässerns. Die meisten Bauern bewässern Tag und Nacht ihre Felder mit großen Sprinklern. Wir haben ja nur alte Apfel- und Pflaunenbäume auf unserem Grundstück, denen wir kein Wasser zuführen. Sie bringen eh viel zu viel Obst, das wir gar nicht verbrauchen können. Die Äpfel tragen dieses Jahr vom Prächtigsten. Viele werden wir kompostieren. Wir suchen uns nur die Besten aus, die zweitbesten Äpfel bekommen unsere Gartenvögel, die diese sehr lieben. Das waren die neusten Nachrichten aus unserem Garten. Viel Glück beim Bau deiner Bewässerungsanlage. ist dies hier etwa Deine erste Antwort, von der Du glaubtest, sie sei im elektronischen Nirvana verschwunden? Datum und Uhrzeit zufolge sieht es ganz danach aus. Hier nur noch eine kurze Bemerkung zu unserem Rasen: gestern habe ich mal eine Stell, wo er ganz verdorrt aussieht, mit einem Rechen bearbeitet, und es sieht mir ganz danach aus als ob er da absolut tot ist. Es kommt die blanke Erde zumVorschein, keine Spur mehr von Wurzeln, und auch die Rhizome sind trocken und brechen ganz leicht – was bei Bermudagras normalerweise nie vorkommt. Selbst wenn sie trocken aussehen, sind sie kaum zu zerreissen. Das sieht meiner Meinung nach gar nicht gut aus, und wir haben leider grosse Flaechen in diesem Zustand. oh dear! Aber ich würde die Hoffnung nicht aufgeben. Ich sah schon aus völlig vertrockneten Wurzelrhizomen bei Feuchtigkeit plötzlich wieder Gras hervorbrechen. nein, die Hoffnung geben wir nicht auf! Aber wir denken, dass wir im Herbst ein paar groessere Flaechen nacsaeen (lassn) muessen. Oder mit Grassoden neu anlegen lassen. Mal sehen, was uns der Profi-Gaertner und die Beraterin von der staatlichen Beratungsstelle [hatte ich, glaube ich, schon mal erwaehnt] so sagen. ich säe mit 75 kg Saatgut jeden Herbst den Rasen nach, überall. In dem Saatgut ist auch gleich der Rasendünger enthalten. Ich dünge nämlich anderweitig nie meinen Rasen. Hier sagen die Fachleute, je mehr bewässert und gedüngt wird, desto weniger stressbeständig wird der Rasen. Aber du musst auch sehen, während bei euch die Bäume den Charakter des Gartens bilden, ist es bei uns die Dreiheit (wie das kölsche Dreigestirn 😉 Rasen, Hecken, Wege. Bei unserem Garten trägt der Rasen stark zum Gesamteindruck bei. Wir mähen übrigens parallel zu den Sichtachsen vom Haus (auf den Effekt machte mich Fürst Pückler in seinen Ausführungen zur Gartengestaltung aufmerksam). So, genug des garden talks. Ich muss jetzt mit Peter weiter an Dinas Fahrrad basteln – eigentlich gucke ich nur zu, gebe schlechte Ratschläge und reiche Werkzeuge an. P.S. Pücklers Buch über Gartengestaltung ist eigentlich mehr für deinen Garten geeignet, da der Gute im Grunde stets an Landschaftsgärten denkt. Du hast ja eher einen kleinen Landschaftsgarten. wenn wir so weitermachen, dann wird es hier zu “Klausbernds & Pits Gartenblog”! 😀 Deswegen halte ich mich jetzt mal zurueck. Huch, eben schrieb ich dir eine lange Antwort, die sich aber wohl im virtuellen All verlief. Auf ein Neues. wir bewässern ja nur unsere Tomaten und Blumen, was schon genug Wasser verbraucht. Den Rasen liessen wir braun werden. Auch bei uns kommt grüne Wiese wie ein Flickenteppich zurück. Unsere alten Obstbäume bekommen kein Wasser von uns, da sie eh zu viel tragen. Das meiste kompostieren wir, die besten Äpfel sind für uns, die zweibesten für unsere Garenvögel, die sie lieben. Wir hsaben Pflanzen in Kübeln reduziert, da diese viel Wasser regelmäßig benötigen. Nach deinem Prinzip bewässern einige hier ihre Tomaten. Da wir keine Wasserverbrauchsbeschränkung haben, lassen viele Bauern Tag und Nacht von großen Sprinklern ihre Felder feucht halten. Das war das Neuste von unserem Garten. Wir haben jetzt höchst angenehmes Wetter, heiter bis wolkig und um die 22 Grad C. So lieben wir es. Dina hat ein fesches Fahrrad bekommen. Oh Schreck, ist das eine Fummelei z.B. die Bremsen richtig eunzustellen. Zum Glück ist mit der Gangschaltung alles in Ordnung, aber diese Hinterradbremse schafft mich doch glatt – wie auch einiges Anderes an diesem Rad. Du hättest da sicher ein besseres Händchen als ich. schade, dass Deine erste Antwort im elektronischen Nirvana gelandet ist, und dass Du so noch einmal von vorne anfangen musstest. Wenn mir so etwas passiert, dann aergert mich das ungemein. Erstens, weil dann eine laengere Tipperei vergebens war, und zweitens, weil es mir nie gelingt, genau das wieder zu schreiben, was ich vorher hatte. Hier ist es nun wieder recht warm, und vor Allem auch schwuel – schon am Morgen. Ja, Dina kam ganz begeistert von diesem Foto-Workshop zurück, obwohl das Thema Macro nicht so ganz ihre Interessen traf. schoen, dass Dina von dem Workshop begeistert war. Dann bin ich mal gespannt, ob wir demnaecht auch Makrofotos von iher zu sehen bekommen. Nee, lieber Pit, das glaube ich eher nicht – aber wer weiß? Nur noch einmal schnell zu Rasen: Wir werden im Herbst etwas Rasen nachsäen und den gesamten Rasen düngen. Wir haben übrigens keinen englischen Rasen sondern eher eine Wiese. Da hilft es, das Gras kurz zu halten und unser Gärtner mäht den Rasen alle 2 bis 3 Tage. Das macht er jetzt seit einem Jahr und der Rasen ist deutlich dichter geworden und es gibt immer weniger Unkraut in der Wiese. Bei uns ist das große Projekt, einen Weg mit Platten von der Terrasse zum Kompost anzulegen. Wir sind ja vor Staunen fast umgefallen, wie viel das ausmacht, wenn die Platten auf der Terrasse und dem Weg zum Kompost und Gartenschuppen ordentlich in der Waage liegen und die Platten mit einer leichten Salzsäurelösung gereinigt sind. Das wertet sogleich das gesamte Grundstück auf. Bei uns sind es 3 Elemente, die vor allem die Wirkung unseres Gartens bestimmen: der Rasen, Terrasse und der Weg zum Kompost, die Hecken. Wir können dir sagen, die Hecken toll in Form zu halten, das ist viel, viel Arbeit. Auf der anderen Seite bereitet es uns große Freude, wenn der Garten einladend aussieht. Zur Zeit haben wir gerade große Tomatenernte. Das verlangen wir auch von Pflanzen, denn sie schluckten das meiste Wasser bis jetzt. Dina wird sicher dir ein Foto von ihrem Fahrrad senden. was wir haben, das wuerde ich auch nur stellenweise als Rasen bezeichnen, und als “englischen” ueberhaupt nicht. Der wuerde unser Klima auch gar nicht aushalten. Maehen tue ich ihn wohl zu selten, aber mehr als hoechstens ein Mal pro Woche kann ich die 4 bis 5 Stunden dafuer nicht aufbringen. Das ist auch nur fuer das reine Maehen. Dann muss ich noch mit dem Rasenkehrer drueber [auch noch einmal 2 bis 3 Stunden] und mit der Motorsense Kanten schneiden [wiederum 2 bis 3 Stunden]. Wir werden wohl auch im Herbst nachsaeen muessen. Da muss ich aber zuerst einmal fachmaennischen Rat einholen. Bei uns sind es eher die Baeume, die den Charakter des Gartnes bestimmen: fast wie ein Park. P.S. : Auf die Fotos von Dinas Rad freue ich mich schon. gerade haben wir mit dem Schlauch unsere Tomaten bewässert und ebenfalls den Olivenbaum, dem es erstaunlicher Weise z.Zt. auch zu trocken ist. Wir haben heute feinen Sonnenschein und 4 bis 5 Windstärken (WSW). Der Wind ist zwar angenehm lau, aber er trocknet alles noch mehr aus. Für Mitte nächster Woche ist Regen angesagt. Wir haben das Gefühl, dass endlich die lange Trockenperiode beendet ist. Unser Gärtner mäht den Rasen mit einem professionellen Rasenmäher, allerdings nicht zum Draufsitzen sondern zum Schieben, der ein Vakuum erzeugt, das allen Rasenschnitt in den Korb saugt. So braucht nicht geharkt zu werden, obwohl das nicht so ganz stimmt, denn wir harken mindestens zweimal jährlich unseren Rasen, dass er mehr Luft bekommt und der Unterwuchs und das Moos herausgerissen wird. Aber, wie gesagt, wir haben auch keinen englischen Rasen, sondern eine Wiese, die zwar nach dem Mähen einem englischen Rasen gleicht, was aber nicht lange anhält. Wir wünschen dir und Mary einen wunderschönen Sonntag. Dina wird wohl erst ihr Fahrrad fotografieren, wenn’s völlig instand gesetzt ist. Es ist nämlich ein richtig gutes Fahrrad, das jedoch 2 Jahre unbenutzt im Freien stand. Die Tage habe ich erst einmal alles entrostet und gut geölt. Und immer noch fummele ich an der Hinterradbremse herum, die nach dem Bremsen einseitig nicht mehr die Bremse löst. Da hoffe ich schwer auf unseren Gärtner, der mehr und mehr zum Mädchen für alles für uns wird, vom Butler bis zum Fahrradbastler. Nun sollte er allerdings erst einmal die letzten Meter Plattenweg fertig machen. Ich muss da immer etwas hinterher sein, sonst beginnt er zig Projekte und führt keines zu Ende. Aber wenn er arbeitet, arbeitet er schnell, exakt und richtig gut. ich glaube, ich bin wie Euer Gaertner: ich kann auch sehr gut zig Projekte anfangen und dann keines davon zu Ende fuehren! 😉 Seelenverwandtschaft! 😀 So, wie Du ihn beschreibst und was er fuer Euch tut, ist es genau das, was wir hier als “Handyman” beschreiben wuerden. Und apropos Butler: der fehlt uns hier noch, aber/denn wir haben eine “Butler’s Pantry”. Ein wenig davon kannst Du hier sehen: https://wp.me/p4uPk8-1su Ich glaube mich zu erinnern, dass man so einen Raum in Deutschland als Spuelkueche bezeichnen koennte. Hier ist es ein kleiner Raum zwischen Garage und Kueche, mit Schrankraum und einer Spuele. Ich habe, wie Du auf den Bildern sehen kannst, Kaffeemuehle und -maschine da stehen. Ausserdem haben wir einen Tiefkuehlschrank da drin. Eigentlich ist ja Peter bestausgebildeter Gärtner, der in Kew Gardens lernte und bei der Royal Horticultural Society, aber er istzugleich der ideale Handyman (was man hier auch sagt). Fuer uns ist diese “Butler’s Pantry” wirklich prima. Die Spuele da koennen wir benutzen, wenn etwas Schmutzigeres abzuwaschen ist, was wir nicht in der Kueche tun moechten. So much space, air and water. Endlessly beautiful. we thought that you would like these pictures showing the best side of the sea. You are from the Netherlands, aren’t you? We know that you have great beaches as well. These photos are fabulous! what an amazing sight of sea and those endless stretches of sand. My only previous knowledge of Norfolk was from a play by Noel Coward “Very flat Norfolk” was the line that stayed in my memory. I shall think fo Norfolk differently now. It is flat but impressively flat. a lot of folks think of Norfolk as a flat country. The beaches are wide and flat but the hinterland is mildly hilly. The area where Dina took her photographs is well described in Jeremy Page’s novel “Salt”. Thanks for mentioning Noel Coward we haven’t come across before. Siri 🙂 was just googling him. The play was Private Lives. I saw it in London many years ago and Maggie Smith was the actress who delivered that line with her usual combination of wit and disdain. Thanks for this info, dear Anne. Siri is looking if there is video of Private Lives on youTube. What spectacular expanses of clean unpolluted sand. Dina’s images so remind me of my childhood beach holidays. Nowadays there is only ‘broken’ sand dunes and miscellaneous pieces of rubbish caught under driftwood and seaweed. It’s great that such clean empty beaches are still exist! Simply wonderful photos. Thank you. Huch, liebe Pia, bei der Hitze am Strand joggen? Davon können wir nur abraten. Es ist ja nicht nur die Hitze, die einem zu schaffen macht, sondern besonders die Sonneneinstrahlung, die vom Wasser reflektiert wird und das zum großen Maße, da wir keine nennenswerte Luftverschmutzung haben, die ultraviolettes Licht mildert. Eine große Falle, der viele erliegen, ist die angenehm kühlende Seebrise, die einen nicht merken lässt, dass man einen Sonnenbrand bekommt. Also, nix joggen am Meer. Es ist mehr ein Klima zum Faulenzen zur Zeit. Also, keep cool und nicht zu viel tanzen. Scheinbar geht es aber auch sportlich meditativ, mein Bruder verpasste die Quali für Hawaii beim IronMan Hamburg um 4 min. Das Schwimmen fiel wegen Blaualgen aus, dafür mussten sie länger laufen, was ihm entgegen kam, aber trotzdem nichts nutzte. Danke für die Regenwolken, liebe Pia 🙂 🙂 Leider sind sie noch nicht angekommen. Tja, das mit dem Iron Man ist so eine andere Welt für uns, ehrlich gesagt, völlig unverständlich. Aber jeder hat so seins. Zu sich oder von sich weg laufen?! Manche in diesem Sport haben es geschafft, dass sie einafch fit, glücklich und zufrieden sind und ein Leben mit Reisen, in der Natur und anderen Menschen über diesen Sport führen können. Gehe jetzt wieder tanzen, schwitzen, aber ganz gechillt…so weit möglich…. Ok, Siri, Selma, könntet ihr mal in Frankfurt vorbeiflattern, was da jetzt wieder los ist? Nein, ihr habt keine Lust? nicht schlimm…wird sich zeigen…. Nee, unsere beiden Buchfeen hatten ‘keinen Bock’ nach Frankfurt zu flattern. “Viel zu heiß!”, wie sie zur Entschuldigung anführten. Wir haben uns das Fliegen völlig abgewöhnt. Im Billigflieger geht’s wie auf dem Kasernenhof zu, und dann kommen noch diese Ausfälle und Verspätungen hinzu. Wir verlassen die Insel seit einiger Zeit nur noch per Schiff, da wir es auch lieben zur See zu fahren. Kinderyoga, das hört sich gut an. Ich wohnte vor vielen Jahren in einer Wohngemeinschaft, in der auch ein fünfjähriges Mädchen wohnte. Mit ihr zusammen habe ich bisweilen Yoga gemacht. Wow, war die gelenkig! Ja, die Kids freuen sich schon auf die Kinderyogastunden! Jonas, Christian und Tobi sind heute über Hamburg geflogen…. Gerade gut auf der Insel angekommen, Josi ist auch dort. Jeder macht so seine Erfahrungen…. Wind kühlt etwas ab, immerhin! wir sahen gestern einen kurzen Bericht im Netz über das Chaos am Frankfurter Flughafen im Netz. Auf jeden Fall sind deine Kiddies gut auf der Ferieninsel angekommen und wohl froh vereint 🙂 🙂 :-). Hier scheint die Sonne bei höchst angenehmen Temperaturen. Ihr habt großes Glück, ihr Vier, dass die Strömung den gesamten Plastikmüll nicht auch zu euch trägt! Heute haben wir zum Glück nur 26 Grad in Berlin. Was für eine Wohltat. Da können wir auch mal auf dem Balkon sitzen, ohne gebrutzelt zu werden. ja, da haben wir wirklich Glück, dass an einigen Stränden hier kein Plastikmüll angeschwemmt wird. Diese reine Klarheit verändert sogleich die Stimmung. Wir haben es hier leicht kühler mit einer leichten Seebrise schon seit vielen Tagen, so dass sich ein Großteil unseres Lebens draußen abspielt. Eigentlich ist das auch jetzt kein Wetter fürs Bloggen. Das Meer ruft! ja, eigentlich ist es kein Wetter, um irgendetwas zu machen. Wie beneide ich euch um das Meer. Hier in der Stadt steht die Luft. Zum Glück hat Berlin soviele grüne Oasen. Aber nichtsdestotrotz ist es bei dem Wetter besser, in der Wohnung zu bleiben. Leider! Morgen findet mein Salon zum Gewalt-Freien- Kommunizieren statt, ich bin schon gespannt, wer sich alles aufraffen kann, zu kommen und wie die Diskussion verlaufen wird. dann wünschen wir dir einen lebendig spannenden Salon. Mir fiel gerade ein, naja, eigentlich hat’s mir Siri 🙂 zugeflüstert, zumindest verbale Kommunikation benötigt des Worts Gewalt, andererseits wird sie langweilig. Hier ist es auch sehr warm, aber längst nicht so heiß wie bei euch. Wir haben gerade 25 Grad C, und es geht eine erfrischende Seebrise. Bei diesem Wetter findet bei uns das Leben draußen auf der Terrasse statt, und wir unternehmen viele Ausflüge ans Meer. Das Wetter wäre toll, wenn’s nicht so trocken wäre. So liegt jeden Morgen und Abend das Gießen aller Pflanzen an, die unter dem Wetter ziemlich leiden. In den 35 Jahren, die ich hier lebe, hat’s nie solch einen langen, beständig warm und trockenen Sommer gegeben. Er verführt zur Trägheit. So lernen wir gerade die süße Kunst des Nichtstuns, was uns äußerst gut bekommt. Ja, Klausbernd, tatsächlich war die Diskussion gestern auch nicht gewaltfrei (von der Kommunikation) aber dafür sehr belebend und spannend! Nun reise ich gedanklich wieder zum Beginn des 19. Jahrhundrts und schreibe meine Masterarbeit weiter. hier ist es über Nacht richtig kühl geworden, wir haben gerade nur 19 Grad C, eine höchst angenehme Temperatur. Es scheint jedoch die Sonne und Bilderbuchwölkchen segeln übes Haus. Das ist doch prima, wenn die Diskussion belebend und spannend ist. So sollte es ja in einem Salon zugehen. Nichts ist langweiliger, als wenn alle der gleichen Meinung sind. Solch ein (klein)bürgerliches Harmoniestreben ist doch tödlich fürs Denken. Glorious beach shots, Dina! Seeing them I feel hope that there still are empty and clean spaces in our western world. And in the rest of the world as well… It is easy to give up hope. no, you don’t need to give up hope, there are quite some empty and clean spaces here – and we suppose in the rest of the world as well. But we have to fight that they stay clean. Are these horrible fires at yours under control? We very much hope so! Thank you for the encouragement. The fires…are under control, but new ones are coming. Most danger in Skane where I live. Yesterday the trains were cancelled because of fires along the rails. We keep our fingers crossed that soon some rain will come. What a pity, the beautiful forests of Skåne are on fire where our dear Master was picking blueberries and playing hide and seek when he was a child. We hope you are safe. Na, die Berge haben doch auch ihren Charme. Da kannst du sicher ebenfalls klare, saubere Stellen finden und es ist kühler dort. Wir waren absolut verblüfft über die 27 Grad Wassertemperatur des Kanals. So warm wird das Wasser selbst in den Prielen hier niemals. zu den Wassertemperaturen..sogar am Rheinfall bei Schaffhausen wurden 26 Grad im Wasser gemessen..
da sind wir aber wirklich verblüfft. Wir hätten nie gedacht, dass der Rhein so warm werden kann. A visit to the edge where we are as small as a grain of sand keeps us humans humble. Your photographs put us in our place (and show us your place) and I am awed by their beauty. out there you easily get the feeling you are the only person left in our world. We agree you feel small. Last time we had this feeling was in the High Arctic, here we can have it every day. This landscape invites you to meditate and to be one with nature. Great pictures, what a beautiful coastline. Was für Bilder! Sie vermitteln solch eine atemberaubende Weite! Beim Betrachten hatte ich ganz stark das Gefühl des salzigen Meerwinds auf meinem Gesicht. Das ist ein tolles Kompliment 🙂 🙂 Dankesehr! Diese Weite ist in der Tat magisch, man assoziiert sogleich ‘Freiheit’ dazu. in a way, it’s the thrill that adds to the feeling out there, the thrill of getting there and especially of coming back. As we live here we know about the tidal flow in the creeks and about the incoming flood. We time our little adventure tours very carefully otherwise it’s really dangerous. Only wish we humans were more serious about preserving than destroying this natural beauty. Our politicians in Australia need stringing up! There are quite some clean beaches around here but we have to fight for our landscape and beaches staying (relatively) clean. In Europe, ecology is a big political topic. There is a party called “The Greens” in Germany which is an important political power. We hope that your politicians will soon see the importance of ecology as well. That was in Germany more or less the same. Here in England it’s a little bit different. “The Greens” party is still ruling in one German county (the richest one) and it was in goverment for some years. In the UK “The Greens” party exist but doesn’t play any role. Sounds like as Australia is similar to the UK in that respect. Drinks close at hand indeed! Water is never far from where I am inside or outside. tranquillity to anyone’s mind. Totally delightful! Thanks for liking Dina’s pictures 🙂 🙂 It’s really healing out there and these pictures transport this well. How about winds? Are you receiving some breezes or winds to cool you off a bit? We get them here when it’s about to rain and the clouds start to gather. we have a constant sea breeze going that cools us down. Normally those winds come from the North but now it’s hot in the North as well, so the wind is quite warm too. Nevertheless, the temperatures are bearable, fortunately. Wind doesn’t mean rain here. We rather have rain when no wind is going. We had a peaceful day so far. Some very beautiful pictures of the north Norfolk Coast, they reminded me of a pleasant holiday once spent near Holkham. One of the commenters mentioned Point Reys. The difference in my expereince between the Norfolk coast and Point Reys is that on the Norfolk coast there is often a wind that seems to have arrived direclty from Scandinavia! Holkham is not far from where we live and Dina took those pictures. 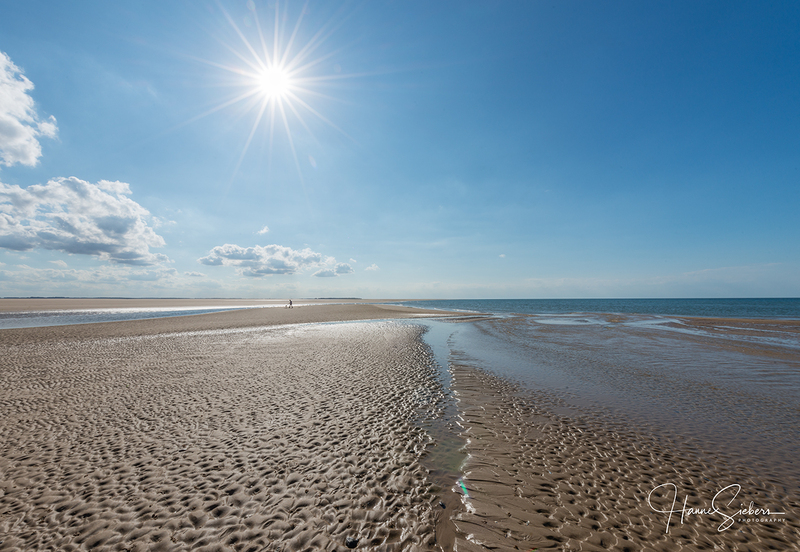 Holkham has this famous wide beach where the end-scene of “Shakespeare In Love” was filmed. You are right, we have often quite a fresh wind. Now, of course, it’s great! And indeed the wind often comes from the North. Thanks for liking Dina’s photogaphy 🙂 🙂 and for commenting. A beautiful blog that expresses your deep love of this stretch of coast – and I share your feelings. Dina’s photographs are magnificent and speak volumes through their own language. Indeed, we love our coast very much. Nearly every day we are out exploring new places. And thanks a lot for liking Dina’s photography. That’s always quite an act to get all her photo equipment out there. But that keeps us fit. we are happy that you like Dina’s photography. The atmosphere out there at the sea is very special, otherworldly. Our dear Bookfayries are always watching the tide for us. We couldn’t get back if we were too late because of all the photo equipment. it’s really great out there! Thanks for liking our post 🙂 🙂 and for commenting. Today we were the whole day outside. We worked on Dina’s new snazzy bike on our terrace, did some meditative weeding and lots of watering. Now we disappear into our sauna. we always wanted to mention it, we love your nom de plume. It makes us smile everytime we read it. we just came in from our garden when we heard this ‘ping’ – your answer came flying in. We really like your answer. Even Siri 🙂 and 🙂 Selma think they are old enough not trying to fit in one of these fashionable categories – actually, in no category at all. They argue with ‘freedom’ – fitting into a category diminishes one’s freedom quite drastically. We suppose that real individuality always needs contradictions or doesn’t care about contradictions like ‘sloppy’ and ‘Buddhist’. Real life isn’t consistent. we experience that being social is an endless source of creativity. We have to exchange and discuss our ideas otherwise we get strange and unworldly. Total freedom is an ideal. Ideals give direction but they can’t be lived. C.G. Jung called those people who believe living an ideal ‘inflated personalities’. We have the feeling that freedom is overrated in our western societies. As we understand, in Buddhism is freedom not getting attached. But you have the Sangha, a community with given rules. Many, many years ago we have been living in Finland where our dear Master used to work. Since that time we have our sauna session every week. We built a Finish sauna in our garden with a view over our garden. In the Finish ‘Kalevala’, a kind of holy text of Finland, the sauna is seen as a sacred place. Grandiose Aufnahmen wie immer! Die Riffelung des Sands sehr schön festgehalten. Überhaupt die Ausnutzung des Sonnenlichts. Bzgl. Plastik ist schon alles gesagt! 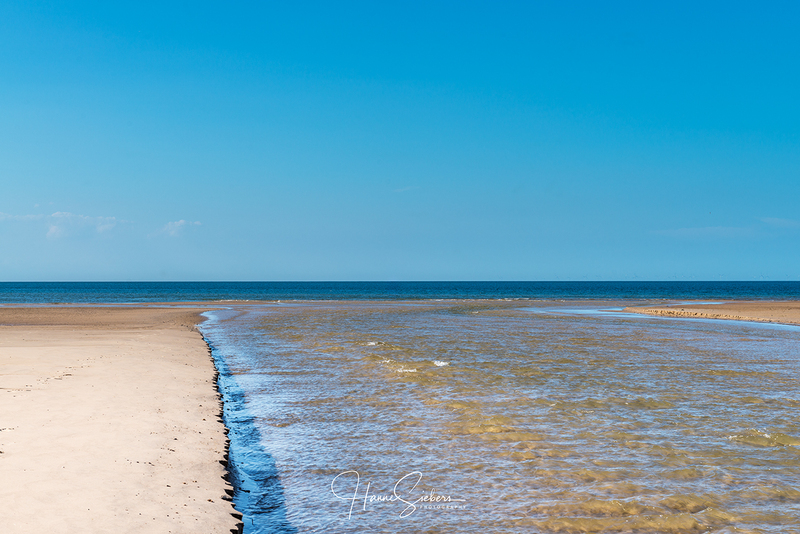 Um zu diesem Strand zu gelangen, müssen wir fast eine Stunde über diesen geriffelten Sand gehen, der so schöne Licht-und-Schatten-Muster bildet. Die Sonne brennt dort allerdings gnadenlos. Die Aufnahmen wurden bei der Nachmittagssonne gemacht, etwa 3 Std. nachdem die Sonne in Zenith stand. A lonely, peaceful looking place but also a beautiful looking place and I can see where it would be to explore. The photo really express it nicely and I like the star burst touches on the sun. The emptiness of this place makes its magic for us. The problem was that there is no shade. It was so hot when Dina took these photos although it was late afternoon. So beautiful and empty. I do love the fact that it is clear and so clean. Don’t see that often anymore. Beautiful photos of a beautiful stretch of our country! Keep cool! we try our best to keep cool. Unfortunately, such clean beaches are quite rare nowadays. We do everything that they stay like this. Thank you very much for liking Dina’s photography. It was quite an effort to bring all her equipment out there. You keep cool as well and drink a lot. So different to the cliffs and dunes we have here, lovely to see. Some of our beaches are like those of the Mediterranean Sea – and especially with this hot sunshine. Our beaches are not as dramatic as in Scotland or Cornwall. 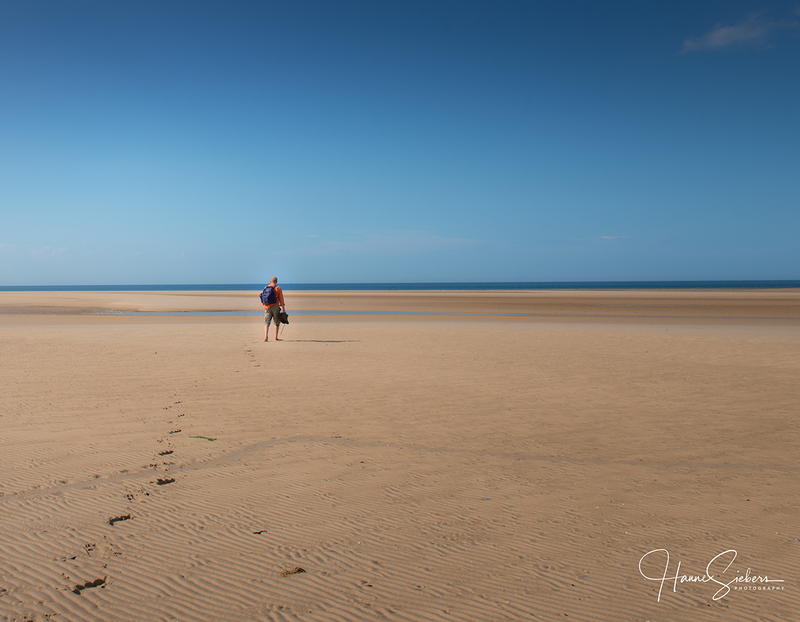 If you avoid the well-known beaches here like Holkham, Wells, Cromer and Sheringham you can still find empty and clean beaches on our coast. The advantage are the saltmarshes you have to cross before you reach those beaches. In the marshes, you can easily get lost in a labyrinth of creeks. And, of course, you have to know the tides. All this keeps the tourists away. Thank you for explaining Klaus. True hidden gems. Our summer here is quite hot and very, very dry. But, I suppose, not like your summers in Australia. We are not used to temperatures around 30 degrees C for weeks. Actually, it’s a bit colder at our coast (around 25 degrees C). The whole of Europe has such an extraordinary weather and the southern countries are really suffering and having big fires. Yes, we have been hearing on the world news of such wild weather conditions. The world is definitely changing. We suppose that’s global warming. We may get more often such summers – and not only here but more or less worldwide. if one is not aware of the tides one has to swim which is actually not that easy because of the strong currents in the creeks. Another problem is the photo equipment – how to get it across a wide and deep creek. Anyway, Siri 🙂 and 🙂 Selma are always watching the tides for us and study the tide table before we go. So we are on the safe side. Wishing you a happy week. Stay cool! out at these remote beaches, you feel like in a dream, it seems too beautiful to be real. What amazing pictures. Who knew any part of the ocean’s shores were clear of plastic. Lovely. it’s great that there are exists such parts. The currents seem to love our coast as well. Most of the plastic seems to be around Hawaii. We are very sorry about the fires in Sweden. We hope very much that they are extinguished soon. Siri 🙂 and 🙂 Selma try their most powerful fairy magic and we keep our fingers crossed. When I was a child I loved to pick blueberries in the woods of Skåne. we have quite some litter-free beaches. Of course, these are not the tourist beaches we have here as well. We are looking forward to reading your post about pollution. mit Eurem Textund den Worten habt ihr mich mit auf eine wunderbare Wanderung an Norfolks Küste genommem. Die Weite, die scheinbare Unendlichkeit auf diese Art zu beschreiben, ist bei Euch zu einem filigranen Kunstwerk geworden. Überall ist Raum für weit ausholende Gedanken des Betrachters, der von Euch leicht geführt zu sich selbst finden kann. Ich danke Euch dafür. Gorgeous pictures, Dina! It was hot in Sweden too, in fact the4 hottest July in 265 years. But your pictures are refreshing even in the FL heat. wow, the hottest July in 265 years. Here we have the hottest summer for a long time as well, but we suppose not for such long as in Sweden. Actually, we find it boring sunshine for months and no rain. We would love some rain and fog. Now we are hoping for a real winter with lots of snow. We are happy that you like Dina’s pictures. 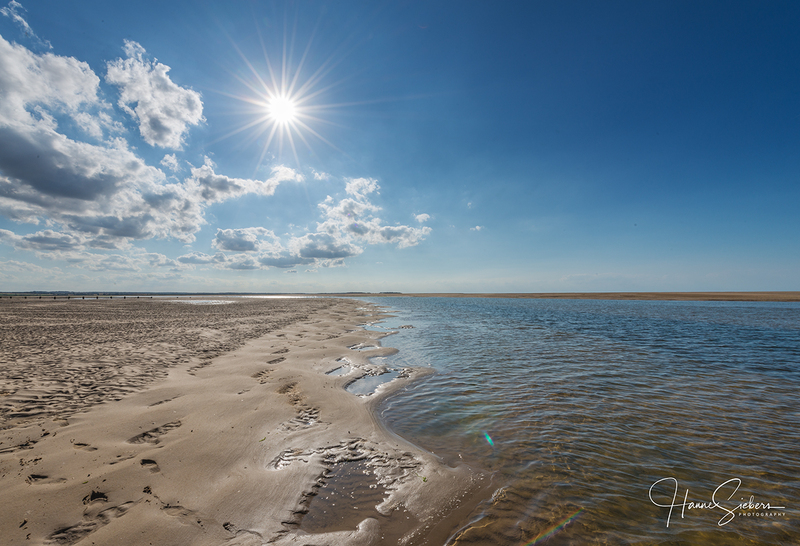 So it was worth it to carry all the photo equipment to this outer sandbank. Good post. It’s a while since I’ve been on those huge beaches. I remember walking the coast from Holme next the Sea via the beaches. To do it you need a tide timetable and may have to wait until the channels are very shallow. I spent a night on Scolt Head, but as far as I can remember you can’t cross the Stiffkey to Blakeney channel, though I do remember wading it from Morston to Blakeney. 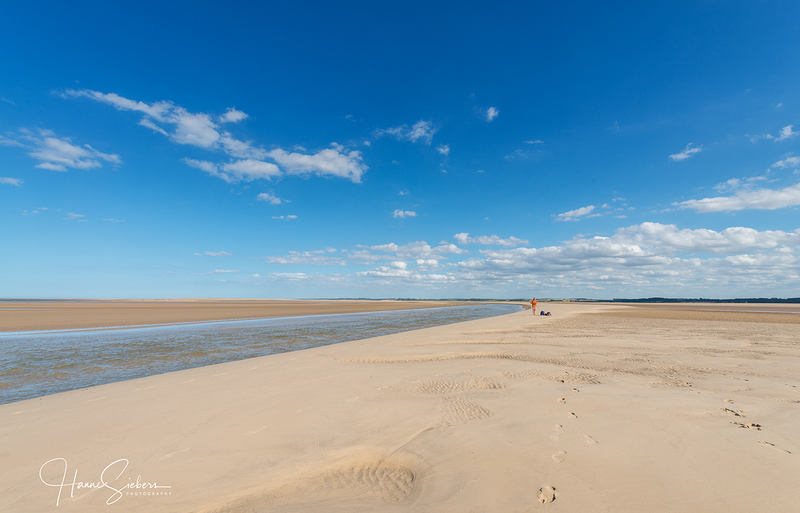 Huge and beautiful and massive skies – greta walking in bare feet on hard sand (especially with a tail wind). Good photos, evoking good memories. actually, these remote beaches are situated off the coast path from Holme to Blakeney. You can’t cross the channel between Stiffkey and Morston – or at least we cannot. It’s too deep and the current frighteningly strong. But there is the bridge of the coast road. The coast path is especially beautiful and easy to walk between Wells next the Sea and Sheringham. You path by Cley, where we live. That’s where the famous windmill is. The big blue skies of our area famous. But as you live in Norwich you know this all. Mr. Maybey’s book sounds interesting, but I can’t find it anywhere in our library system or even larger systems. I did, however, greatly enjoy the feeling of distance and space engendered by the lovely photos. Cheers! you find Richard Maybey’s book “Home Country” at amazon f.e. Here you find his autobiography in every public library. It’s a kind of classic of writing about nature. I appreciate the texture of the sand in the fourth picture. for our feeling, everything has a pleasing graphical structure out there. The magic of this texture of the sand is based on the repetition of the similar but not the same and this for miles. Yes, we think our Bookfayries have been visiting your blog. They love castles. They envy those Scottish fairies with their long hair and living and spooking in gothic castles. But now they are happily enjoying beach life. Absolutely gorgeous beach photos! It’s wonderful to know that there are still pristine beaches and crystal clear rivers and creeks somewhere in the world. these clean beaches are part of an AONB (Area of Outstanding Natural Beauty – an official rating in Europe). We don’t have big polluters around, there is no industry and no bigger road f.e. and the currents seem to love these beaches too. We suppose, with rising the ecological consciousness of the locals most of the Norfolk beaches could be as clean. We think, there is hope – we know it’s late but we hope it won’t be too late. You have so many comments, but I just couldn’t resist from adding my two cents. What a post! It has everything—beauty, philosophy, personal experience, and the last—a punch in the gut about global warming. Wonderful post! thank you so much for your kind commentary 🙂 🙂 we really appreciated. it is a beautiful place, indeed! And so clean. Wow – what stunning shots and such a pristine beach! we are very happy to live here on the North Norfolk coast. It took us quite a while to find this place. In the end, we had 3 places to choose from: the Swedish coast (especially Gotland), the west coast of Canada (Vancouver Island f.e.) or the North Norfolk coast. And we happily ended up here. Such a glorious place, and so very different from our Texas coast. 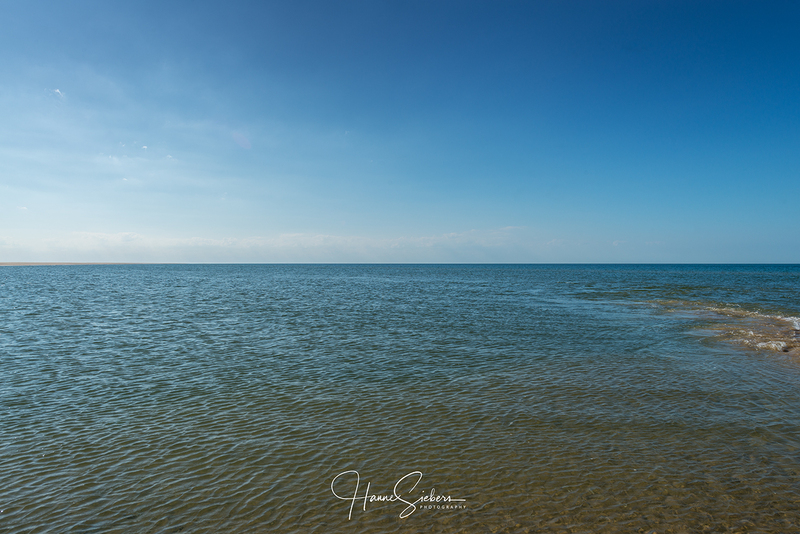 We do have mosquitoes, though, which help to make up for our lack of pristine water, long, open beaches, and a horizon that seems to go on forever. 🙂 Seriously: the liminal places in our world are the most interesting, and this surely is one. Enjoy it in good health! We are aware of how lucky we are concerning the nature here. Norfolk is a rural country, with no industry around here and no bigger road. Organisations like the NT (National Trust) and the NWT (Norfolk Wildlife Trust) are very active in rising the ecological consciousness. Living in such an area you are much more aware of the changes in nature. You care more for your surroundings. But, of course, we have touristy beaches as well, but they are relatively clean too. And we’re all glad that you share it with us! quite some sea lavender is growing in our marshes here and give them a purple shine and sea campion giving them a pleasant scent. We suppose there are sea marshes on most of the tidal coasts of the world. These wetlands are very important for the wildlife. Your coast is gorgeous, as are your photos. Yes, the absence of garbage is remarkable. It looks pristine and untouched. Thanks for sharing! We love our coast very much and there are always some new places to explore by foot or boat. It’s healing to walk along such clean beaches. Beaches are a favorite place of mine in the natural world. 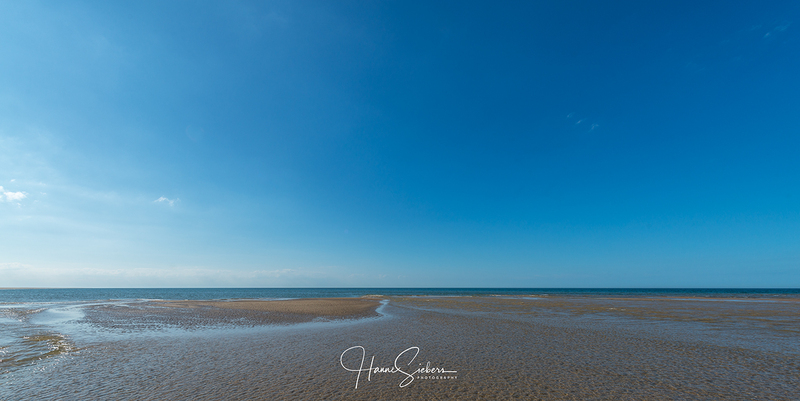 I once walked the coast of the North Sea in The Netherlands – The beach was wide and clean there as well but I do not think it was as picturesque. We know, there are vast sandy beaches in the Netherlands as well. Most of these beaches are quite clean. But there are very few saltmarshes. These marshes with their creeks make our beaches that picturesque. auch hier haben wir inzwischen höchst angenehme Temperaturen und geregnet hat es zum Glück auch. So ist die Welt wieder in Ordnung. Die Pflanzen freuen sich mit den Gärtnern. Ja, es ist schon magisch an diesen einsamen Stränden, die wir sehr lieben. Dir wünschen wir einen wunderbaren Rest der Woche. Beautiful photos, my dear friends! Waw! Super beautiful! I am jay-t back from road tripping through West-Ireland & saw the Atlantic ocean for the 1st time! We also swam there! great reading from you again. Such openness and big space. Must be amazing to actually be in a place without any human leftovers. But it’s not often one get to experience this part of the country bathed in such warmth, is it. Unfortunately not the best sign of our planet’s health. Best wishes from—finally—a rainy Bergen. a place without any traces of humans as far as you can see has a certain magic. It immediately radiates a kind of ‘Robinson Crusoe feeling’. We love playing being the only people on our planet there. Here the weather changed a couple of days ago. First, it rained quite a bit, now the temperature is pleasant (around 22 degrees) and the sun is shining again. Gorgeous photos – I feel like I’m there with you! I love how the sand and the sea and the sky seem to stretch out forever. Heavenly photographs! This is what I love so much about the North Norfolk coastline. Thank you, Fab Four! it really feels like being in a paradise living here. 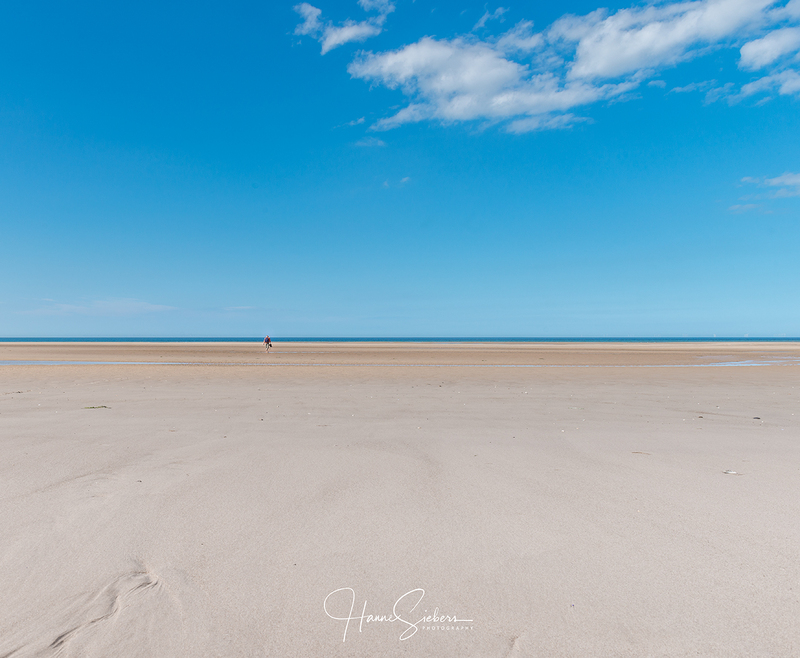 We love these big skies and empty beaches. Oh dear, we hope we don’t attract more tourists coming to our coast. A visual pleasure, indeed. The sea kisses the sand… lovely! I loved your writing & the beautiful shots of Dina’s photos! So cool! great to read from you again! 🙂 🙂 And thank you so much for liking our post. Absolutely stunning photographs. Love the landscape and the grooves and ridges in the sand. The expanse of sky against the sand is breathtaking. Roll your jeans up and come around! You will love it, we are sure. Haha! I would love to 🙂 Thanks Klaus.